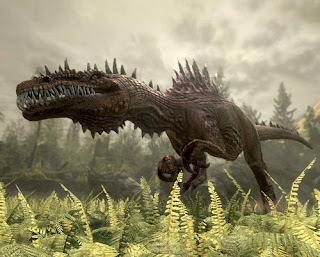 The world needs more games where you wander around and are chased by dinosaurs. Activision has heeded this battle cry, announcing Jurassic: The Hunted. It will launch November 3rd for all three modern consoles and, bizarrely, the PS2, for cheap. I'm not even sure what kind of a game this is, but it will feature "arena-style fights, sieges, survival modes, and suitably large boss fights, with an adrenaline mechanic that allows the player to target the enemy's weak spots in slow motion." SOLD. There hasn't been a good dinosaur-themed FPS since...well, honestly, Turok: Dinosaur Hunter on the N64 (I hestitate to call Turok 2: Seeds of Evil dinosaur-themed), so it's about time we got a new one. And this game looks beautiful. Heavily stylized, but I don't care. That looks like a Todd Marshall Spinosaurus! Click the link for more screenshots, including what appears to be Torosaurus. Looks like fun if you're into FPSes, but I can't get over the fact that I want to beat the character design team over the head with a brick. I don't even like video games, and I think this looks cool.